Lipo-Laser is a non-invasive reduce reduce fatlipolaser slimmingfat treatment andreduce fat is lipolaser priceconsidered one of the most innovative methods to reduce the appearance of cellulite and improve body contour. The Lipo-Laser is an FDA approved, physician validated technology. The reduce fat treatment is not based on heat development but on photo chemical and photo biological effects on cells and tissue. When the laser radiates the adipocytes (adipocytes are present in the adipose tissue and store energy as fat) the contents of the cells move out of the cell membrane and become liquefied and are easily removed from the body. The breakdown of the fat stored inside the fat cells is known as lipolysis. 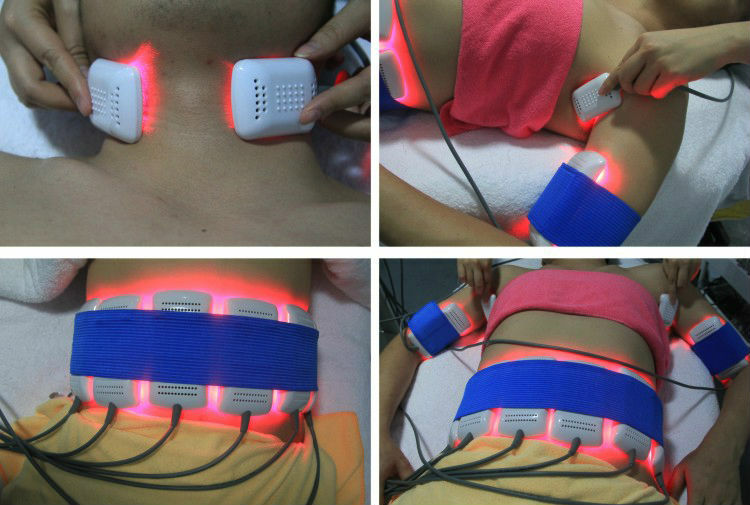 LipoLaser pads containing laser diodes that eimit specific wavelengths of light designed to target fat cells reduction (620- 680nm) are placed on the patient's skin for 30 minutes per treatment on targeted areas. 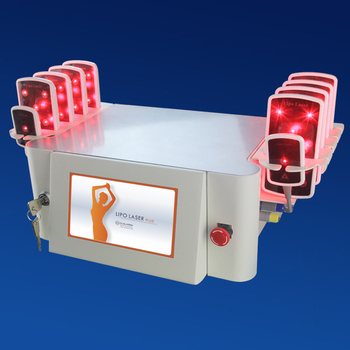 Laser energy safely and painlessly penetrates several millimeter into the subcutaneous adipose or fat tissue layer. The adipose cell walls are made permeable for a temporary period allowing cell contents to spill out into the inter space. The fat (in the triglycerides) is converted to free fatty acids, water and glycerol. 1. 10 pads: 8 large pads with 8LDs on each pad, 2 small pads with 1LDs on it. 4. Size of big pad: 130mm*66mm, small pad:66mm*45mm. 1. Pure metal-made case, with textured outward and reduce heavy-duty quality. 2. Apply high power laser diode lamp (<=130mw each), deep penetration. 3. Apply medical film to conduct laser light for higher efficiency of light power, up to 98%. 4. Medical film is disposable and hygiene, avoiding sweat polluting the laser lamp and cross infection of skin. 1.We suggest each treatment takes 20-30 minutes. 2.Customers take treatment every two days. 3.Customer will reduce fats after 4-6 times of treatments. 4.Our boss tests this machine herself. And after two times of treatments, her skin of abdominal area becomes tighten.